Thank you for supporting Product of Culture's pop-up shop POP x POC UDC in March 2018! The limited-edition brick and mortar store was created in partnership with UDC and hosted some of our favorite South Asian brands, influencers, and artists. The Pop Up included: Atif, ByBadal, Babbuthepainter, Jessie Sohpaul, Rootsgear Clothing, Jasmine Lakhesar, and Taxi Fabric. Check out all the creatives and their bios below and give them a follow on IG! UDC provides a platform to leading global South Asian artists of the Urban Desi scene at a state of the art concert venue in the heart of New York City. Singers, rappers, DJ’s, and entertainers of the diaspora create the unforgettable experience of the Urban Desi Concert and we look forward to working with our UDC fam in 2019! A Pop Up gets it’s vibe from the music and talent that encompasses it. A big shout out to the DJ USA team, especially DJ Sharad and DJ Rohit for bringing the beats and creating a bangin’ pre-party for UDC 2018! Our Urban Desi OG artists are some of the best at supporting up and coming talent. Pop Up was elevated to the next level because these artists showed their support in person: Heems, Anik, Raxstar, DJ Rekha, Jaz Dhami, and Arjun. All the credit for photos and coverage from the Pop Up go to the incomparable HYFN, Farhat Sikder, and Mohammad Alam. Special shout out to HYFN for the dope re-cap video. They love supporting brown creatives, have done legit work for our community, and have been champions for POC since day one. With each Pop Up, Product of Culture grows and we look for ways to create a more inclusive space for all South Asian creatives. For POP x POC UDC we were able to sponsor gallery space for three insanely talented South Asian artists @shantanu.sharma, @the.curly.hair.artist and @reena.paints. Our three-day open call for creatives resulted in over 140 submissions which shows us that creatives need collective support from us all now more than ever. We look forward to continuing our sponsored spaces. We're grateful to the nearly 500 people that came out and we can't wait to bring the pop up back to New York! We see you London, Mumbai, and Houston. Want to see your favorite artists in your city? Tell us! Atif Ateeq is an artist and content creator from Brooklyn whose work aims to create impact and conversation within the brown and Muslim community. He passionately explores the duality within our identity and how that manifests in the form of new culture. 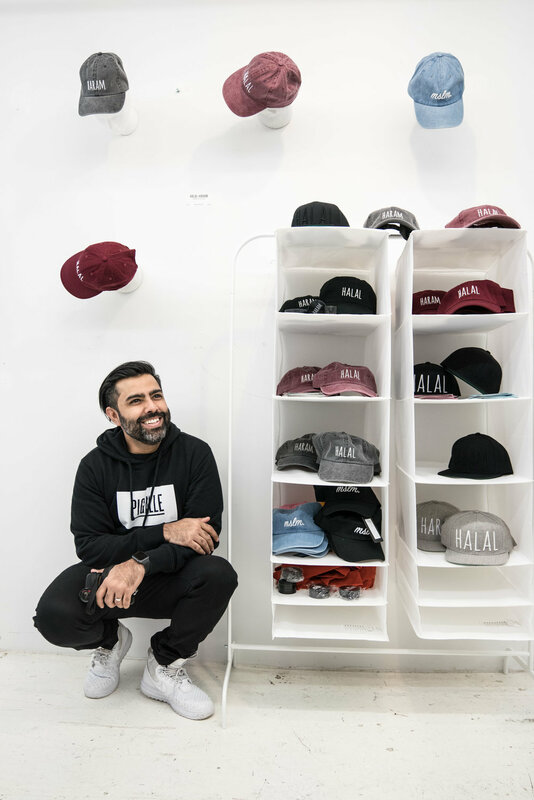 His HALAL-HARAM hat project spread globally and explores the wide spectrum between HALAL and HARAM that we all live in. He is the cofounder of HYFN, a platform that documents the modern creative experience within the brown and Muslim community through visual storytelling. He hopes to spread pyaar and inspire all brown kids with big imaginations. Badal is a multi-disciplinary graphic designer based in the Greater New York City area. With a keen eye for design and a knack for problem solving, she designs things ranging from influential brands to Indian inspired swag. In addition, Badal created ādara, her line of stationery that redefines the Indian wedding scene. You can check out her tips on how to fuse an East meets West design aesthetic for an all around lifestyle at her blog (www.bybadal.com/blog). Babbuthepainter is a Toronto based creative entrepreneur and the founder of her globally recognized style of modern desi diaspora pop-art. Babbu has manifested the unheard voice of South Asian millennials in her artwork that navigates her self-discovery as a child from an immigrant home through painting, photography, sculpture and animation. As an OCADU Alumni, she developed her skills through combining rich traditional Indian art of miniature paintings with pop art and launched her brand in 2015 with a focus on creating online content and bold fashion pieces for her wide spread audience. Babbu has showcased her work internationally, collaborated with brands like Converse, Loreal, Fenty Beauty, Vice and her artwork has appeared in season five of The Mindy Project Show. Rootsgear Clothing Co. is the dopest market place for South Asian inspired street wear. In addition to their in-house brands, they carry merchandise brands for South Asian Hip Hop artists such as Raxstar and Fateh. Turning taxi seat covers into canvases - creating a great outlet for designers to channel their talent and enhance the everyday travel experience of thousands of locals. This platform has made contemporary design available to everyone. A true Mumbaikar who has recently moved to New York, Samiksha is a conceptual artist. She finds pen ‘and brush’ mightier than the sword and love using them together to convey her art. Each of her work reflects her embracing the experiences and feelings life has to offer. Shantanu Sharma is an 18-year-old graphic designer and illustrator from New Delhi, currently studying in New York at School of Visual Arts. Shantanu’s work is deeply personal and reflects feelings of anxiety, battles with stress, fear, and homesickness. Using surreal and psychedelic visual anecdotes, Shantanu creates vibrant and detailed illustrations to tell his story. Reena is a 19 year old artist currently studying at Western Connecticut State University. She uses her work as a way to empower women in her community and promote gender equality. As an intersectional feminist, she actively encourages individuals around her to fight for their rights and break social norms.